Yeah we will do a few races in 1 night to play catch up. Probably 10-20% races, 50% races for the remainder. We look forward to you guys racing in the comp!! Please post there PSN so i can put them on the OP. Id have loved to get this started but i was a bit late planning it so sorry for that. What rules are we gonna play? I wont be using any aids, but we need to decide if we will have fuel wear and the tyre model active? So can get back to practising. I have my headset....come on Easter!!! What are we gonna do for the German gp? lol nah just do hock. Im back now so ill get the others ready and get this started soon. Yeh I don't even play online and the whole thing is bugging me, I wanted to download some stuff from the store. Nope, still waiting. PSN should be back online for some of us today. No Playstation Store, but F1 2010 should be working online. The game is working isn't it? My PC is rubbish I'm afraid. I had original dirt on my PC (also by Codemasters) and framerate was unplayable. Had a really good race around Monaco just now..100% race distance ..no aids. I started ( on the option) in P7 and managed to get into P1 by lap 6. Then pulled out a 5 second gap on JB who was in second. I then made a mistake on the exit of the swimming pool and went into the wall on the exit light, damaged front wing. JB then went into the back of me which pit him well down...Vettel now P2 10 seconds behind me. Around lap 20 i start to loose grip and Vettel starts closing to around 6 seconds over 3 laps, so i decide to pit, chuck a set of options on again and do a 2 stop. 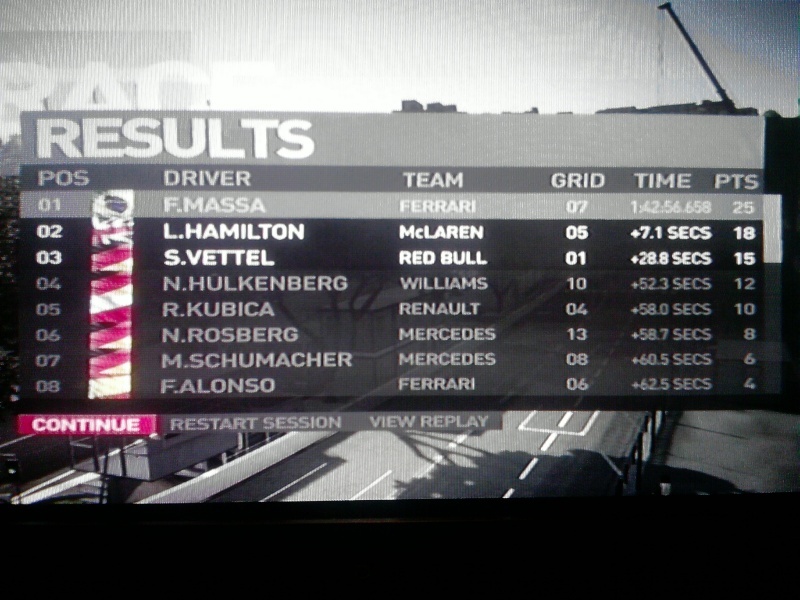 When i exited the pits i was 8 seconds behind Vettel, with Hamilton in-between us. I knew they were on a 1 stop so knew i had to overtake them. Lewis was easy to overtake as he was on the hard, Vettel soft. Managed to catch up to Vettel by around lap 38 and overtake him when we were going through traffic. Then pulled out a 5 second lead. I knew i had to stop for the hard at some point so decided to wait for Vettel to stop. I was thinking I'd go for that trophy last to first place 100% distance at Monaco. Update: I did it! 78 laps, expert difficulty, starting from last place. One stop strategy, started on hard tyres, made my first pitstop with 20 laps remaining. Was 20-30 second down on the leader for most of the race. My fresh soft tyres plus some traffic saved the day and I won comfortably by over 10 seconds. I did the whole race with my left foot on the pedals. Anyway, with my injury and all, I have been playing a tonne of F1 2010 online.
. POS . ONLINE ID . RANK . . XP . RACE WINS . Let is know your username and I can add you to the list (if you like). I wouldn't mind some kind of Nextgen Auto race meet soon. Would be nice to play with people who don't rage quit, ram into me, kick me, check their mirrors, etc.